The thing is launched! The developers have dispersed, the designers have high-fived, all of the items on your launch checklist have been dutifully checked off. Maybe there’s still confetti floating down from the ceiling. Your project is done! Let’s talk about project closure. The project closure phase is the last phase in the project lifecycle, and it officially puts an end to the project. When you have worked long and hard on a project and it’s finally completed, it’s hard to find time to really close it down properly. However, it is definitely in your best interests to have a closure procedure so that you cover every base and can safely archive it in that Great Closed Projects Folder in the sky. Or the cloud, whichever. Why Is Project Closure Important? Why is it important to close down a project properly? It’s so tempting to just move to the next thing after a project launches. The extra time and energy to do even more work after the fact seems daunting, but it’s really in your best interest as PM to close it officially. You will get more out of the experience, you will show your team (and your boss) that you are competent and professional, and you’ll probably glean at least 2 things, usually more, that you can take with you to your next project to make it more successful. Plus, we are PMs, we like things to be orderly. If you *don’t* close a project properly, you can be setting yourself and your company up for some tough situations: clients coming to you well after a project is over complaining that items were not completed, realizing after launch that some critical component was missed, or not addressing team issues that carry into new projects. As a PM, you know that any of these problems could derail any new projects you’ve started working on, so do yourself, your company, and your team a favor and follow these steps to close your project. Go over every plan/timeline to make sure there was nothing you forgot. Sometimes, when the heat is really on during a project and you are just trying to get to the finish line (or even if you’re working steadily, really) you can skip past things accidentally. This happens, even for the most organized PM. We all make mistakes! For the things you just skip over when you’re busy, try to mark them in some way or use a reminder service (like a good old-fashioned calendar invite if you have to) to be sure you don’t forget it completely until the end. When my client is using Outlook, I use the “remind” function within the email itself. I have heard that if you use Google’s Inbox (rather than regular Gmail) you can do this there, as well. If you do find something you missed, don’t panic. If it were critical, it likely would have come up in QA or UAT. The best thing to do it to be transparent to your team and to your client, and find a way to weave the items in. Scour your notes/messages for anything that you deferred from this phase if it wouldn’t fit, couldn’t be accommodated, etc (in scope, out of scope). For things you purposely set aside to deal with “later”, find a solution that works for you for making what biz-jargon folks call a “parking lot” or just somewhere you can house things so they won’t be forgotten. I am a visual person, so I use a whiteboard that’s in my direct line of sight. Some folks will create a Trello board or other area within their PM tool of choice just to house these items. For each item, you need to determine if it is in scope or out of scope. In scope items should be tracked carefully so that you are incorporating them when the right time comes (or at least sometime before launch, or within a plan to update after launch that the client has signed off on.) Out of scope items make a lovely email to the client as you close out the project, and will score points with your business development team since they can be sold in as updates. Write a wrap-up note to your team to let them know that the project launch was successful. There’s nothing like a thank you email to help folks feel accomplished. It doesn’t matter if the project was small or the work simple – when it’s done, make sure the team is acknowledged. I like to mention something specific each person contributed as a way to make the email less “stock” and feel as sincere as I feel. The wrap up email can also mention anything else that needs to happen (anything you might have forgot, see #1). Wrap up the client portion of your project to ensure they know the project has ended (and therefore, scope has been completed) and to congratulate *them* on their new launch. Let them know about any lingering issues, any URLs, links, or login information they might need, and anything else they should expect as the project ends, like a final invoice. This email can really help solidify a partnership with a client, and can also be used to kick off a maintenance project, should you have been lucky enough to help sell one in. Yes, every time. Yes, even if it was uncomplicated and went smoothly. A retrospective is not meant to only showcase how to fix things that went wrong, although that tends to be the focus (especially on a tough project). It’s also meant to show what went right, and how to replicate that over other projects. There’s always something you can learn about a project through a retrospective – even if it’s just “we thought this would happen and we were correct. The “anonymous survey” (I use quotes here because though I do like to at least have them give me their names, I respect confidentiality) is a great way to get really honest feedback that people who aren’t good at confrontation – namely most people, especially in development. I ask questions as simply as possible, and to encourage participation, I think of answers and present them as a multiple choice, with a write-in option. This has worked far better than open-ended questions. If I know something specific did not go well, I will word the question “What did not go well?” and put some of the things that I am sure contributed to the issue as choices, letting the user choose more than one and write in others. Once the survey results are in, I use those, in addition to my own notes I take throughout the project, to come up with a comprehensive deck that I share first with the project team, then with the executive team once I incorporate any comments from the project team. The big takeaway here, though, is DO a retrospective in any way you think works best for you. Not all clients are open to this, and not all companies are willing to let you ask, but if you have a good relationship and know it won’t cause problems, ask about what went well and what didn’t go well. I don’t make as big a production of this as I do with our internal retrospectives, but there’s insight from outside your company that you could find valuable. I’ll usually just ask a few questions in email, casually – like “Hey, was there anything that specifically stuck out for you about this project, good or bad, that you can tell me about?” It’s not extremely invasive, and can easily be ignored if the client is not inclined to give you additional information. For maximum impact, get client feedback before finalizing your internal retrospective and share the information with your team. Internal feedback is great; client feedback is irrefutable. I work primarily remotely with people all over the globe. That means, other than grainy video calls, I never see the people I work with. When I worked in an office, I’d be sure to bring in something for each of my teammates, and they always appreciated it. So, even though I’m remote, I still send a little something to my teammates when we’re done with a project. I live outside of Philadelphia, and I found a little local trinket shop that sells tiny liberty bells, so I send those out after a successful project close. Simple things like that (the bells are super cheap – but the shipping can get pricey) go a long, long way in building rapport and trust. Think about doing something special for your team after a project, even if it’s just bringing in their favorite treats or buying a round at happy hour. In some teams, project closure requires some accounting updates, or possibly documentation requirements that apply in some verticals. There could be any number of things that the PM is required to do at the end of a project that you might not think to do. You should already have a good sense of what is required, but if you’re not sure what is expected of you, make sure you ask! Take a really deep breath, and if you can, a nice break from work for a bit to congratulate yourself on a job well done, and to clear your mind for your next launch. This advice isn’t just for complex projects, where it’s pretty obvious that you should take a breather, but even for more run-of-the-mill projects. Clearing your head, putting a mental “period” at the end of the project sentence, can be really cathartic. If you can get outside, that’s ideal – look up at the sky, get a lungful of fresh air, allow yourself to go through the last little bits of loose ends from your retrospective and the look on your team’s faces when you gave them a tiny cupcake in brand colors, and breathe out. Reset for the next big wrap-up. And give yourself a high five if no one is looking (as that is super awkward to see). Congratulate yourself. You did an awesome job! Wrapping up a project properly is impressive to everyone involved in the project, and it will make you a better PM. The first few times you go through all the steps, it can be daunting, but it will get to be second nature. An important note: It’s necessary at the beginning of the project to account for these steps at the end, if you must bill all of your time to the project. If you don’t have the budget for this kind of wrap up, it’s always helpful if there’s a billing bucket for overhead per client so you can still show that you’re doing work for them while not adding hours to the project budget. If you don’t have the option to bill to overhead or to admin or any other non-billable bucket, try to ensure that you have time built in at the beginning of the project to cover project closure. If you get to the end of the project and there’s no way to account for the hours needed to follow all of the closure steps, do your best to prioritize what will be most helpful to you, the team, and your company. In some cases, when there was no budget for a retrospective, I have pitched to management the need for internal review for the purpose of validating existing process, and that’s usually won me enough time to do a short retro and present findings directly to the management team. And, of course, going outside and celebrating by yourself doesn’t cost a thing. Now, get out there, and close some projects! Here’s a checklist to keep handy that can help remind you of all the project closure steps that you need to consider. I have something similar pinned to my corkboard that I reference constantly, with scribbled notes on it based on many, many uses. Feel free to use this and add your own items, too! 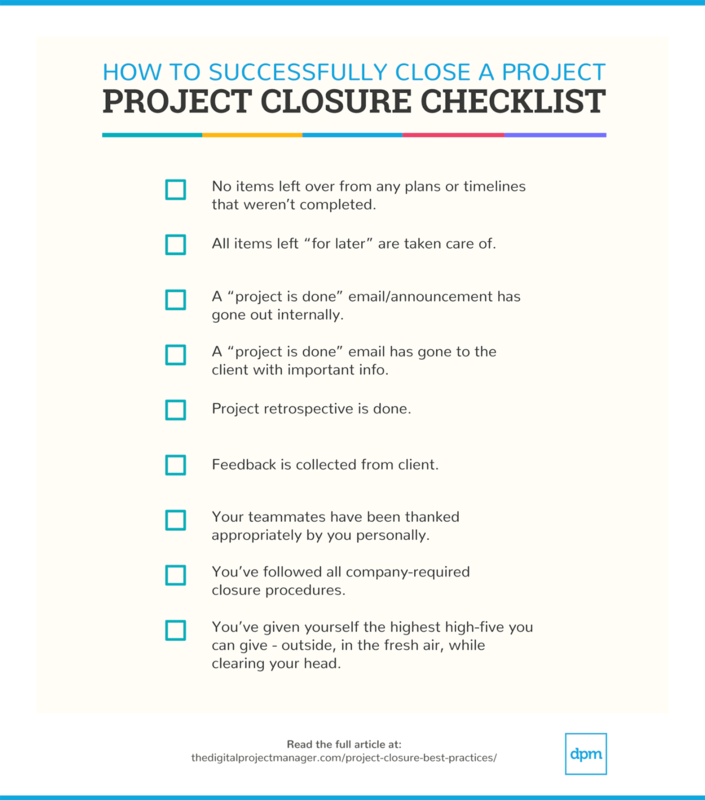 Use this project closure checklist to close your projects the right way. I'm Patrice Embry, a freelance digital project manager and Certified ScrumMaster. After 18 years in the field, I've been fortunate to work for agencies, corporations, and everything in between. My clients have spanned far and wide across verticals - pharmaceutical, finance, construction, ecommerce, race cars, you name it. My client roster includes Exxon Mobile, Merck, Granite Construction, Edwards Lifesciences, GS1 Global, and many more. I've worked on large scale websites, mobile apps, CRM and CMS systems, even print! I'm passionate about project management philosophy - it shapes what I do every day. My website is http://patrice-embry.com, and you can find me on Twitter @patrice108.